It was a really dark and rainy night when I met my friend Ember for happy hour after work. 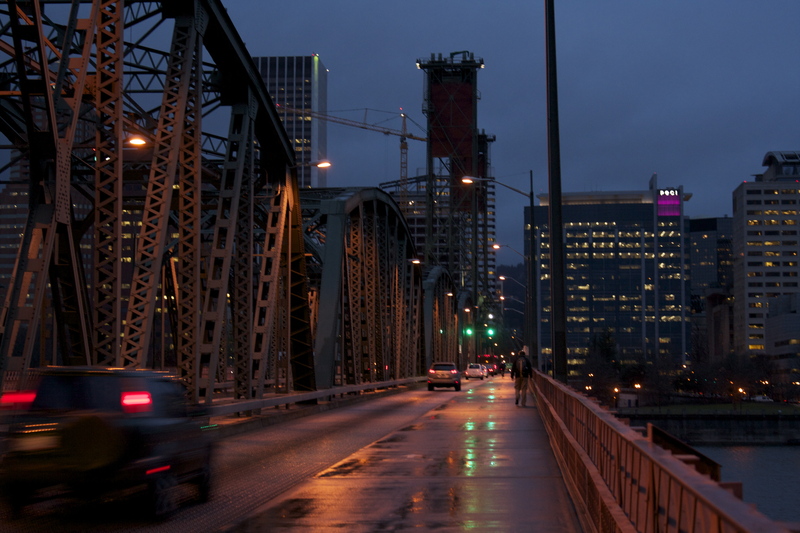 A storm had rolled into Portland with high winds, heavy downpour and a chill to the air. We’ve been lucky for most of December with dry, cold, sunny weather. I guess that’s over with now! Time for soggy shoes. 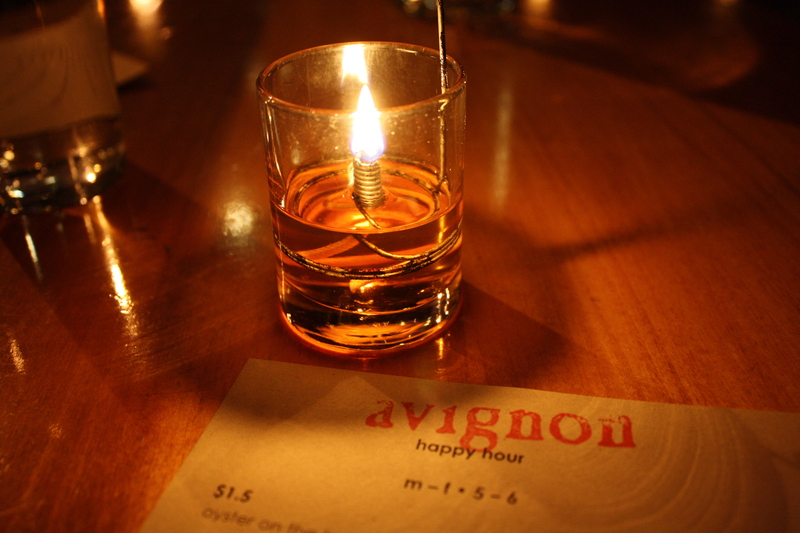 I met Ember at Bar Avignon on SE Division. It’s in a trendy area of town that I used to live near. There is a stretch on that street with a bunch of amazing restaurants. Nostrana, a few cute bars and sushi places. The restaurant was trendy and intimate–the perfect place for a date night or a fun night out with the girls to talk. It was quiet and the music was a mixture of trance and mood music. It was dimly lit by candles and had an extensive bar. The wine list looked impressive to me. 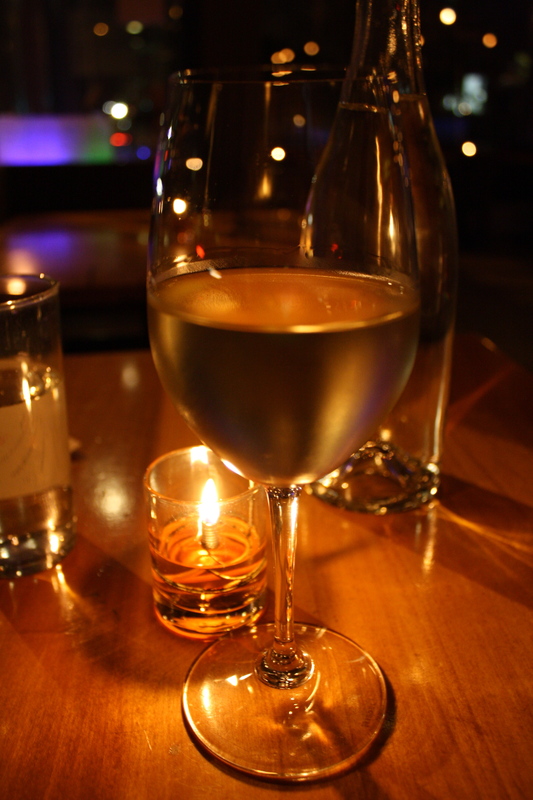 I ordered one glass of wine–their happy hour white wine special. The wine was crisp and tart, like a bitter green apple mixed with grapefruit. It was cool and refreshing and the furthest thing from a sweet wine. For dinner I ordered off the happy hour menu. 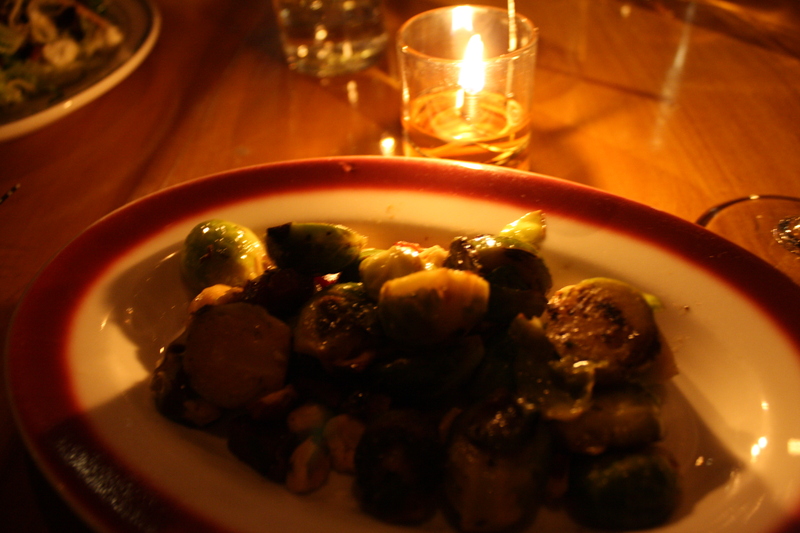 First up: brussel sprouts with toasted hazelnuts and bacon lardons. Oh.My.God. I have a newfound passion for brussel sprouts. They are kind of amazing. And mixing the flavors with bacon and hazelnuts was even more amazing. I loved the crunch and the texture. I will most definitely be trying to make this side dish at home in the future. I wish the pictures of the food had turned out better. 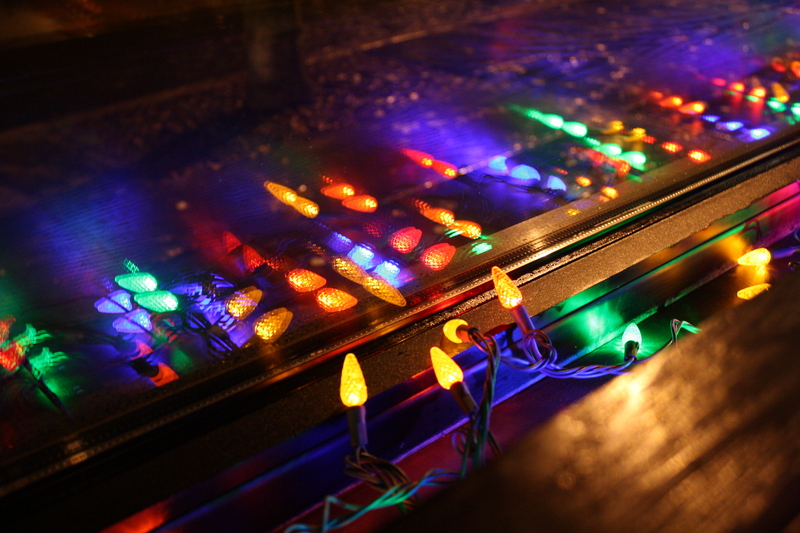 I’m still learning how to use my camera. Give me time! 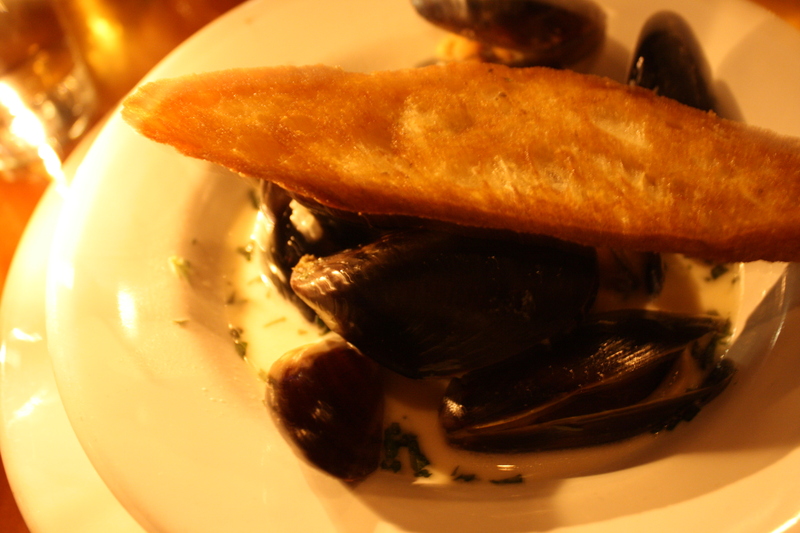 Next up: Washington mussels in a white wine, cream and tarragon sauce. It came with a large slice of bread toasted and tasting like creamy butter. I am most disappointed that the picture of the mussels didn’t turn out. Ugh. Trust me, the picture is horrible but the food was fantastic. All of the flavors went together nicely and I really enjoyed chatting with Ember. Ember ordered the creme brule bread pudding for dessert and I had two bites–delectable. The creme brule flavor in the custard on top was really interesting. 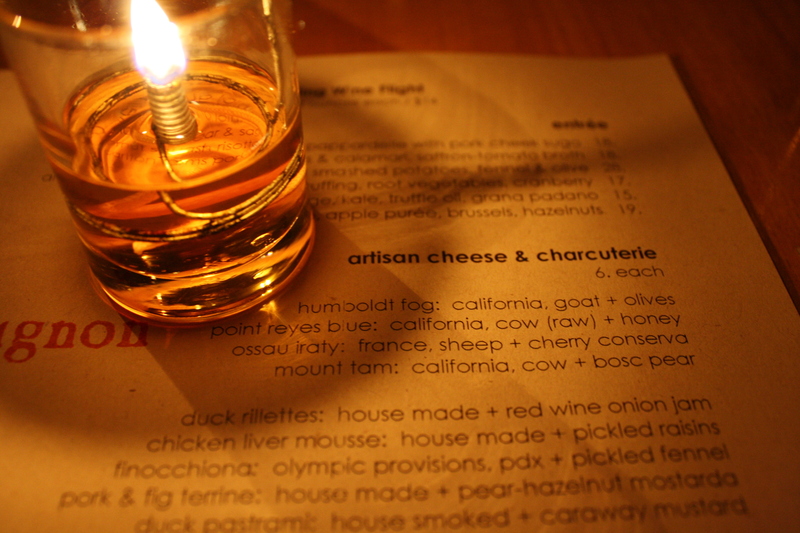 I kind of wanted to order something off their cheese menu–the Humboldt goat cheese with olives sounded really enticing. But I skipped it. I had my sights set on enjoying Grandma’s banana bread at home for dessert. Before I knew it, two and half hours had passed and happy hour was long over. It’s nice to chat with Ember because we have so much in common and she also lost a significant amount of weight. It’s fun sharing stories with someone else who has gone through all that. I would most definitely come back to this place for happy hour. The regular priced meals were a little steep for my tastes but the happy hour was a good medium road. QUESTION: What’s the average cost for an entree that you’re willing to pay? How much is “too much” for happy hour foods? Sounds like a fun time with your friend! I am a HUGE fan of happy hours… I love me some good deals! My favorite types of happy hours are ones where they have cheap drinks AND food, but I can settle for one or the other, too. I went to a place the other night that had half priced bottles of wine!! I got an amazing bottle of Malbec that was normally $45 on the menu for $22.50, and that made my night! Good question. Maybe $12 is too much for me for happy hour foods, especially since in my town they’re usually half-off for happy hour (approx $6 or so). Plus, i usually just get the hummus plate anyway. Yeah that’s way too much. Happy hour prices should be less than $10.